In the mid-19th century in Massachusetts Thaddeus W. Harris was familiar with “this pretty species” and thought that it had not been described before (1862: 308), but in fact knowledge of this small skipper in the New World goes back to John Abbot, who made the first drawing of it in the 1700s in Georgia. It was later more fully described by the Danish naturalist Fabricius. An inhabitant of grassy wet meadows, this skipper seems, like other meadow skippers, to have benefited from the widespread land clearing of the agricultural era 1600-1850, despite the loss of some wetlands in this process (Table 1). It also seems to have remained common through the succeeding period of industrial development; there is not much evidence of any decrease 1850-1950. In his 1934 review of New England butterflies, Farquhar lists many locations in Massachusetts from which Least Skipper had been collected: “Stoneham, Amesbury, Forest Hills, Marshfield, Wollaston, Auburndale, Plymouth, Brookline, Beverly, Lawrence, Salem, Amherst, Nantucket, etc., etc.” In the 1930's and 1940's, F. M. Jones found Least Skipper to be "widely distributed and frequent" on Martha's Vineyard, and Charles Kimball found it "general, but infrequent" on Nantucket, "probably overlooked because of its small size" (Jones and Kimball 1943). “The butterfly frequents low marshy meadows and the borders of runlets passing through them, especially where half choked with wild grasses, or in neglected bottom lands in the moister spots, but especially next to running water,” wrote Scudder (1889:1561). Today the habitat is the same: low moist areas with grasses, including streamsides, ditches, and wet meadows. 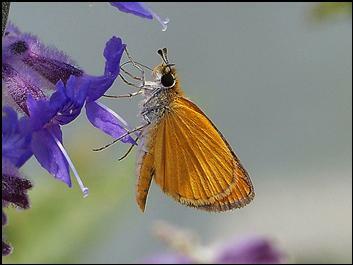 Least Skipper uses a variety of grasses as host plants, a fact which may be one of the keys to its population success. Hosts include Rice Cutgrass (Leersia oryzoides), Panic Grasses (Panicum spp. ), Bluegrasses (Poa spp. ), Foxtail Grass (Setaria spp. ), Cordgrass (Spartina spp. ), and Marsh Millet (Zizaniopsis miliacea) (Scott 1986). As far as is known, it has not switched to any non-native grasses in the wild. Least Skipper’s flight is often described as weak; more accurately, it is slow but non-stop. Scudder put it this way: “It has a feeble flight, never darting about from one spot to another like other Hesperidae, but moving in a leisurely, languid manner, skipping over the grass tops of a lane, or among the reeds of a marshy rill, in the most dainty manner possible..." (1889: 1562). For the 2000-2007 period represented in Table 5, the introduced European Skipper surpassed Least, Peck’s and Silver-spotted Skipper in relative abundance, but that may have changed, since European Skipper is showing a sharp decline from its highs in 1996, 1997 and 2003. List-length analysis of MBC data 1992-2010 showed a statistically significant 48.4% decline in European Skipper over these years (Breed et al. 2012). In MBC sightings per total trip reports, Least Skiper shows a slightly increasing trend 1992-2009 (Chart 86). But the low numbers reported for 1992 and 1993 seem a bit unusual, and it could be that the longer-term trend for Least Skipper is fairly stable. Minimally, there is no suggestion of decline. Similarly, list-length analysis of MBC data 1992-2010, which revealed major changes in the detectibility of many butterfly species over this time period, showed no significant change in the status of Least Skipper (Breed et al. 2012). The year 1997 saw a population explosion on Cape Cod and Martha’s Vineyard, although not elsewhere in the state. The numbers reported from the Cape on single-day counts in August that year were extremely high: 86 in Falmouth Woods Hole, 50 in West Tisbury, 75 on Cuttyhunk Island, 45 in Truro and 400 in Provincetown --- these are from different observers and are areas where the usual August reports are in single digits or less than 20. There were also particularly large numbers reported in 2004 on all three of the Berkshire NABA Counts, suggesting a population high in that region that year. Least Skipper has been found in 150 of a possible 351 towns in Massachusetts, according to MBC records 1992-2009. It is distributed throughout all regions of the state, and is regularly found on all the NABA Counts, although often only in single-digits, probably because it is between flights in mid-July. The Berkshire counts have consistently reported Least Skipper, although in greatly varying numbers: the Southern Berkshire NABA reported a high of 84 on 7/12/2003, but only 1 or 2 in other years; the Northern Berkshire NABA reported a high of 27 on 7/11/2004; but again, 1 or 2 in many other years. The Northampton NABA count similarly had a high report of 51 on 7/22/2012, but 0 to 2 other years. Interestingly, Least Skipper appears to be quite at home on islands. It has been reported from the Elizabeth Islands (Nashawena, Naushon, Cuttyhunk, and Penikese) both in Atlas years and in MBC records. In the Boston Harbor Islands, Mark Mello found it on 7/1/2002 on Calf Island, and the Atlas found it on Thompson’s Island in 1988. The 2006-2007 Boston Harbor Islands study likewise found it on Calf, Thompson's, and Middle Brewster islands (Rykken specimens in the MCZ). The Atlas found Least Skipper at Siasconset on Nantucket, and on nearby Madaket and Tuckernuck islands. MBC observers have also found it on Nantucket; for example E. LoPresti reported "dozens" on the moors on 8/19/2012, F. Model 2 on 8/15/2008 ( photo above). And Least Skipper is common on Martha’s Vineyard, according to MBC records and the Vineyard checklist (Pelikan 2002). Occasionally observers will find especially large concentrations of Least Skippers, or especially productive locations. A few recent such reports in the records are Longmeadow Fannie Stebbins WS, 40 on 8/25/2012,T. Gagnon et al. (max. 111 on 8/17/2008, T. Gagnon and K. Parker et al. ); Dartmouth Allens Pond, 30 on 8/19/2013, G. Dysart; Eastham Fort Hill, 10 on 9/16/2012, S. Arena; Edgartown Watcha Path 35 on 6/26/2001, M. Pelikan; Gosnold Cuttyhunk Island , 75 on 8/30/1997, J. Sones; Lexington Dunback Meadows, 122 on 6/11/2012, B. Bowker and L. Stilwell; Northbridge Larkin Rec. Area, 18 on 8/3/2012, B. Bowker and L. Stilwell; Northampton community gardens, 15 on 9/3/2012, B. Benner; Petersham North Common Meadow, 25 on 6/20/2011, G. Breed and P. Severns; Raynham Borden Colony, 34 on 8/19/2013, J. Dwelly; Wenham Wenham Canal, 10 on 8/27/2011 , M. Arey. According to MBC records 1993-2008, Least Skipper flies from the last week of May to mid-October (http://www.naba.org/chapters/nabambc/flight-dates-chart.asp). It has three full broods in Massachusetts, and indeed throughout most of its large range. Earliest sightings: In the 23 years of BOM-MBC records 1991-2013, the seven earliest "first sightings" of Least Skipper were 5/4/1994 Truro North, T. Hansen (much earlier than normal); 5/25/2001 Sherborn power line, B. Bowker; 5/26/2012 Ware, B. Klassanos; 5/28/2006 Stow Delaney WMA, B. Walker et al. ; 5/29/2010 Ipswich Appleton Farms, S. and J. Stichter; 5/29/2007 Belmont J. Forbes; and 5/29/2004 Grafton Dauphinaise Park D. Price et al. The influence of the particularly warm springs of 2010 and 2012 can be seen. About the spring emergence of Least Skipper in the late 1800’s, Scudder wrote “It appears on the wing early in June, occasionally as early as the 1st but ordinarily not before the 7th in the southernmost parts of New England or the 10th or 12th in the vicinity of Boston; occasionally it is a little later " (1889:1561). And, collector F. H. Sprague reported that the date of Least Skipper's first appearance in Wollaston (Quincy) in 1878 was June 5 (Sprague 1879). Both these historical accounts are quite specific about dates and locations. It would appear therefore that Least Skipper begins it flight a bit earlier now than it did a century ago. In eight of the 23 years 1991-2013, Least Skippers were first seen in May rather than June, in BOM-MBC records. In another ten, or about half, of these 23 years, the first sighting was in the first week of June (6/1-6/7). Thus in 18/23 years the first sighting was earlier than the norm quoted by Scudder. The Atlas also listed the earliest sighting in those years as in May: 5/29/1987 Sheffield, E. Dunbar. Latest sightings: In the same 23 years 1991-2013, the five latest "last sightings" are 10/16/2011 Ipswich Appleton Farms, R. Hopping and H. Hoople; 10/16/2006 Chilmark, A. Keith; 10/16/1994 Gloucester, D. Savich and C. Tibbits (also reported in the MAS Atlas); 10/15/2013 Dartmouth Allens Pond, M. Champagne; and 10/14/1995 Chilmark, A. Keith. In Scudder’s day Least Skipper continued to fly “nearly to the end of September, though in scanty numbers in the latter part of the month" (1889: 1561). In BOM-MBC 1991-2013 records, the majority (15 out of 23) of "last sightings" are in the month of October. Therefore Least Skipper appears to be flying later nowadays. This is particularly the case since 2000; 2000-2013 all last sightings but two have been in October. Although the flight of Least Skippers may be “weak” in terms of speed and height, it is strong in terms of persistence and time line. These small butterflies therefore seem to be good colonizers of new habitat (NatureServe 2010). They have multiple broods, use a variety of host grasses, and the recent trend is flat or upward. The outlook for these skippers in Massachusetts is good, provided there is sufficient moist open area habitat.